Due to budget imbalances and the general suckiness thereof, Berkeley’s powers-that-be propose the increase of garbage collection fees. Apparently, the drop in Asian demand for recycled paper contributes to the increasing value of dump collection. Say what? *Dump our trash on the Stanfurd farm; let them deal with the mess. *Save scraps of receipts and toilet paper to be used for taking notes in class. *Find a Delorean to eat our crap. 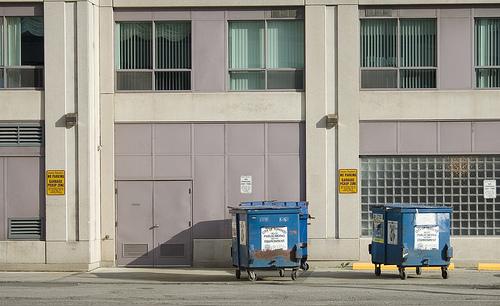 those dumpsters ain’t lookin’ lonely. good for them.